Intermountain Region Porsche Club of America at UMC. Attended a DE with the IRPCA at utah motorsports campus today. Car ran great, and had a blast! We were running the outer loop, which is the fastest configuration. Video here: (FWIW, that blue miata I'm reeling-in has an LS3 in it! Brown turbo carrera in front of that. Critique / constructive pointers are welcomed.... if you're nice about it, haha. This is what cut my day a little short though. Last edited by maytag; 09-15-2018 at 06:10 PM. Quite awesome, and nice video. I miss SLC...for several years I used to have to travel there for work about 1week out of every 6. At night I would either drive up into the mountains, or head west to the flats or Wendover. Your lucky that you have access to a nice facility with a good track. Hmmm. Federal tires? Haven't heard anything about em. Some differing opinions in the attached thread though. Cool! Nothing better than a good track day! 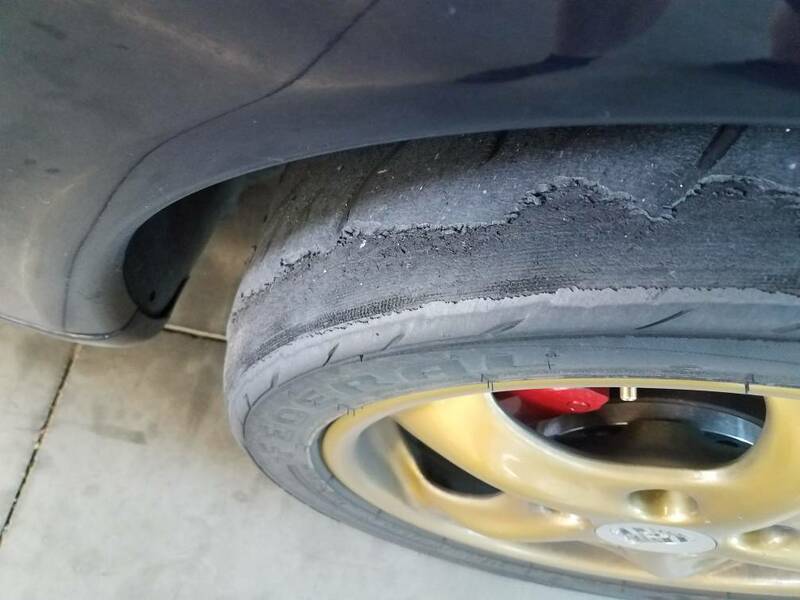 Its not clear from the photo what the rest of the tire looks like, but that wear pattern is often indicative of needing additional negative camber. The video has a lot of movement which made it hard to watch. Get a better mount for your phone. 2nd day, running the full course, 4.5 miles with 23 turns, or something like that. I was a little hamstrung all day, because I was forced to run my street tires: a very, very hard / slippery, Michelin pilot sport AS3. I don't think I was very often going straight.... usually sideways in, sideways out. A hoot.... but slow. And anker, thanks for the productive comment. This RAM mount is the mount that everyone suggested is the absolute best. Im really struggling to make it work. That's really strange. 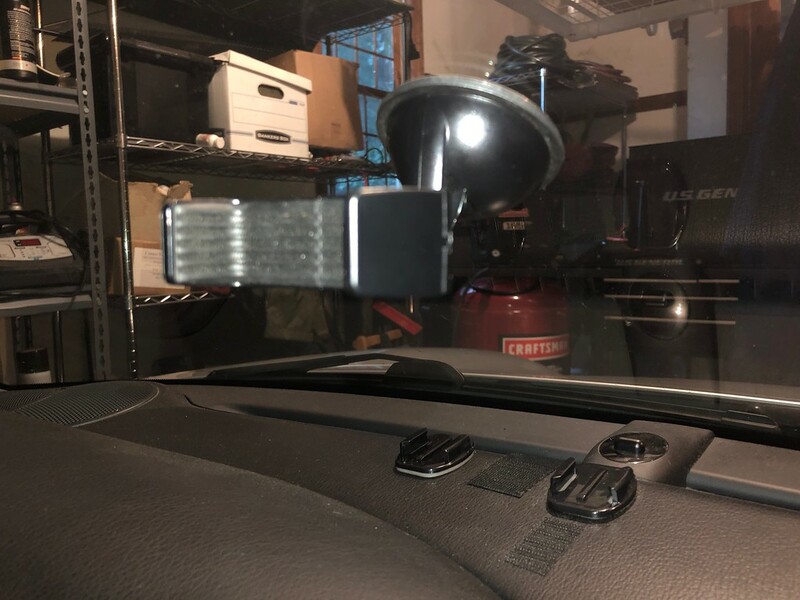 I use a really cheap, but solid, suction mount with a clamp to hold the phone and it works great. Check out this video https://youtu.be/jWnHL4tqW9g. Not perfect, but not nearly as shaky as yours. If you want me to post a photo of it, let me know. Yes, please do post a photo. I'm using the RAM mount that everyone said was the best. but I think the arm on it exaggerates every motion. Tried to find where I ordered it, but no luck! Mine's an iPhone 8 + and there's a lot less shake than on maytag's video. I'm sure its the mount. If you look at my voideo you can see that the image stabilization is working because the mount is solid. If the mount shakes badly the image stabilization just can't keep up.